There's a dual focus in the markets right now: Black Friday and black oil. 1. Oil companies set to take a tumble: Shares in oil companies are set to take a big fall Friday as U.S. stock markets reopen from their Thanksgiving closure. Shares in Transocean (RIG) are plunging by about 8% premarket. Other major energy firms including Exxon Mobil (XOM) and Chevron (CVX) were also declining by about 4%. U.S. crude oil prices fell by roughly 7% over the previous trading session and are now trading around $69 per barrel after OPEC opted to keep oil production levels unchanged at 30 million barrels per day. Many had been hoping for a cut in production, which would have boosted prices. The price of oil has fallen by roughly 35% since hitting a recent peak in June. The drop in oil prices specifically hurts those energy companies that have higher production costs and will be facing lower margins as they sell into an oversupplied market. 2. Travel companies set to take off: Lower oil prices benefit travel companies that need to fuel their planes and cruise ships. So it's no surprise that shares in airline stocks and cruise operators are jumping during premarket trading. 3. Main markets dipping: While shoppers may be excited about the Black Friday sales bonanza, investors are feeling less enthused. U.S. stock futures are generally being weighed down by oil companies this morning, but the tech-heavy Nasdaq is bucking the trend and inching up. U.S. stocks will close at 1 p.m. Friday, marking a shortened trading day after the Thanksgiving holiday on Thursday. Stock markets ended higher on Wednesday. 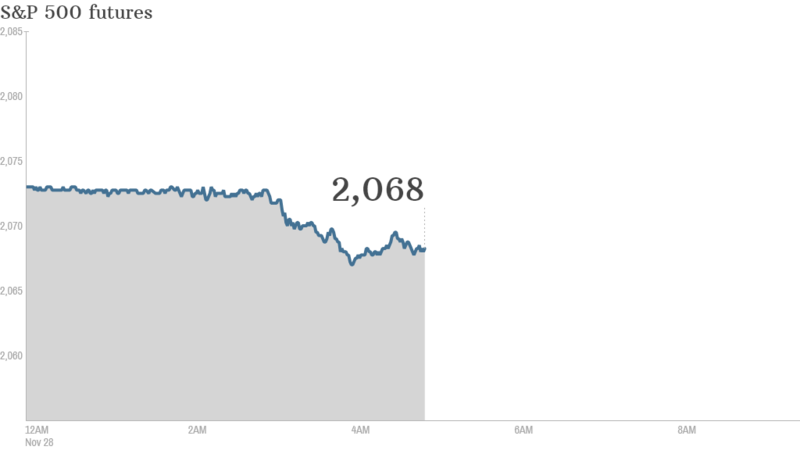 The Dow gained nearly 13 points, the S&P 500 added 0.3% and the Nasdaq moved up by 0.6%. 4. International markets overview: European markets are all moving lower in early trading, but the shift down isn't too dramatic. New eurozone data shows the region continues to struggle with dangerously low inflation and high unemployment. Inflation dipped to 0.3% in November, down from 0.4% in the previous month. Unemployment stayed steady at 11.5%. Many Asian stock markets posted gains Friday, but the benchmark Australian index took a 1.6% dip. Investors are still waiting for the latest GDP data from India, which is set for release at 7 a.m. ET.